England's historic 20-17 victory over Australia in the Rugby World Cup final has drawn praise from all quarters of the rugby world. Fly-half Jonny Wilkinson secured the game for England with a last-gasp drop goal in extra-time, and in doing so sealed the nation's greatest sporting triumph since 1966. 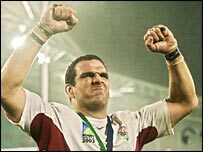 Skipper Martin Johnson produced one of the performances of his career to become the first player to lead a northern hemisphere side to the world title. And while the defending champions Australia fought valiantly, they were ultimately undone by the unerring accuracy of England's vice-captain, who finished the match with an individual tally of 15 points. In extra-time it can go any way but who would you rather have than Wilko? "It was a huge effort by the entire squad of players, coaches and backroom staff, everybody," Johnson said. "Thanks to the fans, they were incredible." Woodward himself was understandably delighted and happy to look to the future with confidence. "We're on a roll and winning the World Cup is massive," he said. "But we have to keep up the momentum. We'll start with the Six Nations and keep this going." Match winner Wilkinson was typically modest, despite his brilliant personal display with the boot. "It's something we've wanted, we've worked for so long both individually and as a team." Where did you catch the match? Back in England, streets and roads across the country were deserted, with millions glued to the television to watch the action. 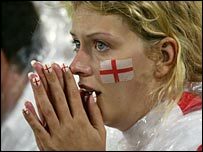 Pubs up and down the country opened early to allow punters to watch the game and British Prime Minister Tony Blair hailed the result as a "fantastic day for England". He sent congratulations to the team after watching the match at his country home of Chequers. "This was a fantastic day for English rugby and for England," he said. "The team can be proud of their performance, their spirit and above all their character." Sports Minister Richard Caborn was unable to attend the game and had to fly home from Sydney for a crucial House of Commons vote. But he said: "What a fantastic victory for England. Credit has to go to Clive Woodward as coach. "All 15 on the park and the entire squad put this memorable win on the same par as the World Cup of 1966 - a great moment for English sport." The victory was hailed by a host of former England rugby greats, including Will Carling, who captained his country during the 1991 World Cup final defeat to Australia. "These are just incredible scenes and it's a great day for English rugby," he said, before paying tribute to Johnson. "His leadership skills are extraordinary, he's not flash - just an incredible rugby player." Francois Pienaar, who captained South Africa to victory in the 1995 tournament, added: "At the moment the players and those fans are emotionally drained. "But tomorrow things will get better and better and better. They won't know yet what hit them, the enormity of it all is just going to grow through the rest of this year." Former Australia star Michael Lynagh was also quick to add his praise. "Australia were outmuscled but kept on coming back, kicking unbelievable penalties under pressure," he said. "But at the end of day the power of England told." Wilkinson's mother Philippa, who was too nervous to watch her son playing, admitted she was out shopping when she heard the result. "I was in the supermarket and the lady on the vegetable counter heard it," she confessed. "I just heard him talking on the radio just now and he is obviously delighted. I am pleased for the whole team."